D1 Web Design is a web design specialist firm that offers affordable web design with a fully responsive website coming with free premium themes from $299.00 each website that is built by D1 Web Design is custom made for that individual client. Just because you see the title affordable web design that doesn’t mean it is not quality work! Affordable web design done right by a company such as D1 Web Design who are web design specialist gives you a custom state of the art fully responsive website that completely converts & is compatible across all modern browsers & devices giving your potential customers the best user experience possible making it more likely for them to spend money. 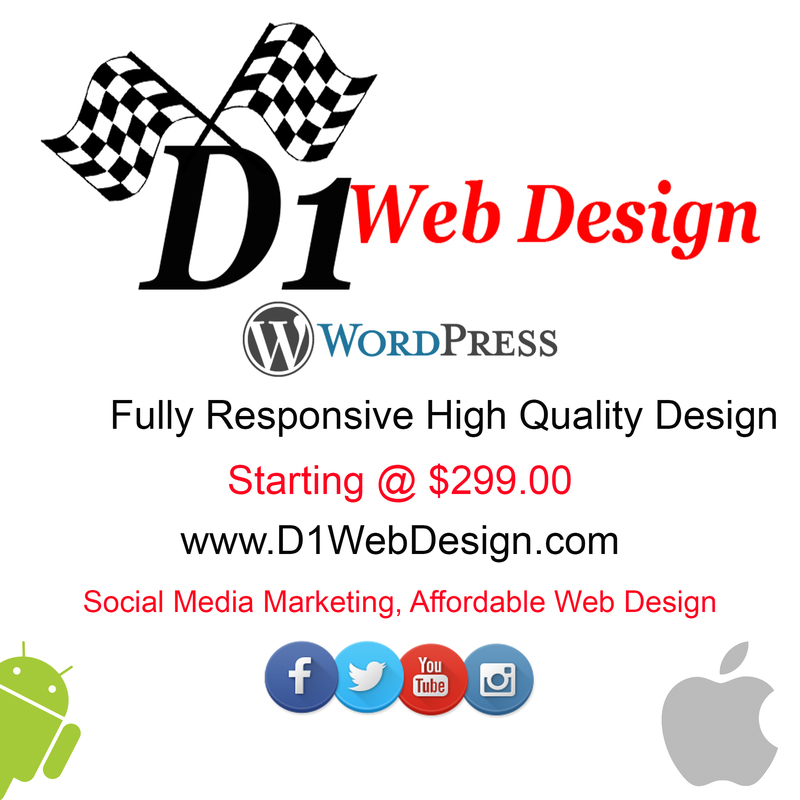 At D1 Web Design we have an unbeatable Small Business Website special & Social Media Package available. We can get your small business website established online for only $299.00 with a custom fully responsive website that has 5 to 8 pages on your very own content with links, social media, SEO, blog, gallery, plugins, calendar, google map & more! D1 Web Design offers very affordable web design packages that can fit into any small business’s budget. DO NOT be one of the many business’s that neglect getting your online marketing/presence up you are going to regret it later on. Maybe your one of them companies that did so and now your regretting it or maybe you just don’t no were to go. We have a solid reputation and many clients that have a successful & profitable business now because of the work we done here at D1 Web Design. D1 Web Design is for everybody’s business no matter if you are a huge corporation or need a small business website to run out of your home we offer affordable web design on all levels. Does responsive web design ensure my website will work on mobile phones Android, iPhones, tablets and iPads? In simple terms, a fully responsive website will have multiple page designs and templates that will adapt and work on every type of device, regardless of the size, brand or model. This really future proofs your website many years so it is an extremely worthwhile investment at this stage. Okay so why do you need a website? When you use a free website-building tool, like WordPress you position your company to reach thousands more potential customers for less than you would spend mailing ten brochures by traditional mail. D1 Web design is a one-stop-shop for your Web Solutions. We can provide you with real likes, followers, views, plays, connections, retweet’s, & much more. « Why You Need A Small Business Website! !